Yesterday, for the first time in a while I started my Playstation 3. (tellingly, I did not start it to play a game but to stream a movie… ). Annoyingly, the controller did not come on, not even while connected to the USB-power cord. At that point I used the secondary controller to watch the movie and left the faulty controller to charge overnight. This morning, still no response on the controller. Tried resetting, resetting while connected to the PS3, and some magic incantations but no dice. Since that seemed like chickening out and I figured I had nothing to loose, I got a bit creative and managed to get the controller working! WARNING: Following the instructions below will void your warranty and any results are solely your own responsibility! 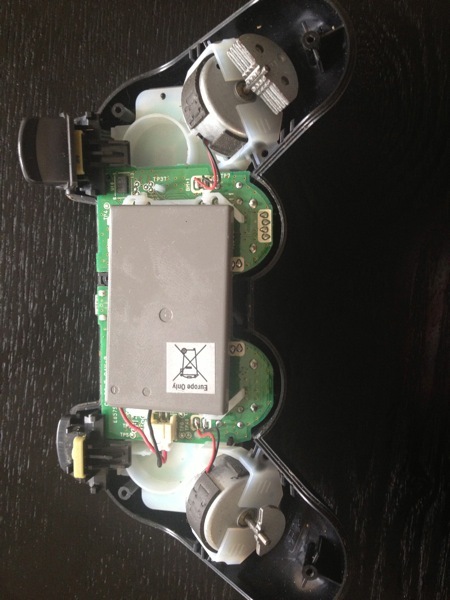 1) Remove (and carefully set aside) the five screws in the bottom and open the controller. Carefully remove the backside to reveal a simple Lithium-Ion 3.7 volt battery. This is where it got a bit ghetto – I stripped a small bit of insulation of the battery leads to be able to connect the alligator clips of my Li-ion charger. 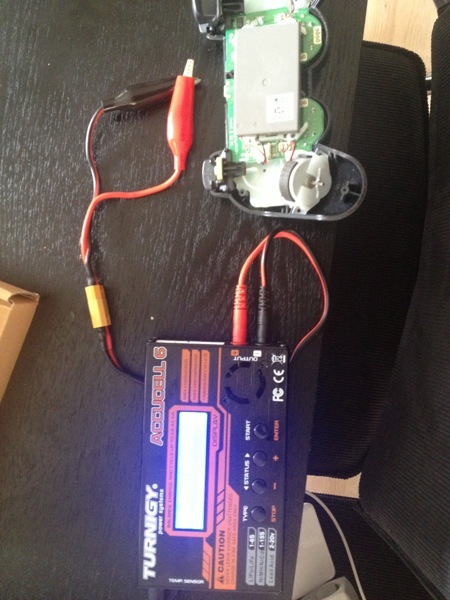 3) With the battery now at 4.2 volt (don’t overcharge, as this may damage a Li-ion pack too!) I tried turning the controller on again, and Bingo! Works on first try. Now reassemble, taking care to maneuver the L2 and R2 buttons in their proper places.